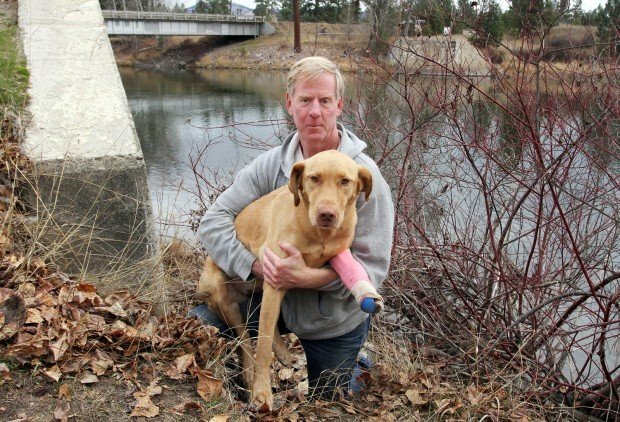 Pete Ramberg and his dog, Monte, came back the Florence Bridge fishing access site Tuesday to look at the spot where the dog's paw was caught in a foot-hold trap on Monday. "I can't believe that someone would set a trap in a place that is so popular with dog owners," Ramberg said. Monte was treated at the Florence Veterinary Clinic after being caught in a leg hold trap. FLORENCE – On almost any afternoon – when temperatures haven’t turned the Bitterroot River to ice – you’ll find Pete Ramberg and his dog, Monte, at the Florence Bridge Fishing Access Site. “It’s always been one of our favorite places,” Ramberg said. An incident Monday afternoon may have changed that forever. The two had traveled from their Florence-area home to spend their usual time tossing sticks into the river and letting the yellow Labrador mix enjoy a good swim. Monte had walked along the river’s-side edge of an old concrete bridge abutment at the fishing access site and had stepped right into an illegally placed foothold trap. Ramberg raced around the abutment and waded into the water to help his dog. The trap was attached to a cable that was connected to an anchor bolt secured in the abutment’s concrete. Ramberg guesses it took him 15 minutes to finally work the cable free from the anchor bolt while his dog screamed in pain. He carried her to the car, with the trap still on her paw. 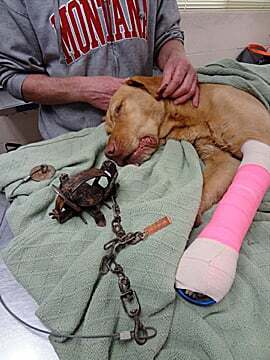 He drove to the Florence Veterinary Clinic where the trap was removed and a splint placed on his dog’s paw and leg. Ramberg reported the incident to Montana Fish, Wildlife and Parks and was told Tuesday the matter was being investigated as a criminal matter. X-rays showed that Monte’s paw didn’t suffer any broken bones. Traps are not allowed in any of the Montana’s fishing access sites without specific written permission from the state, said FWP spokesperson Vivaca Crowser. This specific case is under investigation and could be turned over for criminal prosecution. With the state’s trapping season for furbearers under way, Crowser said there are things that both trappers and dog owners should remember. Despite what happened at the Florence Bridge, Crowser said dog owners can take some solace in the knowledge there are places in both Ravalli and Missoula counties where trapping is not allowed, including all fishing access sites. This year, the Bass Creek recreation area north of Stevensville will be officially off-limits to trapping. In Missoula County, dog owners can feel safe at the Blue Mountain, Pattee Canyon and Rattlesnake recreation areas. “So there are some places where you can go and know that trapping isn’t occurring,” Crowser said. It also should be relatively safe for dog owners wanting to walk along trails or roadways, as along as they can keep their animals in close. Trappers are not allowed to set traps closer than 1,000 feet to trailheads and campgrounds. Along trails and roads, there is a 50-foot setback. For anyone allowing their pet to wander onto private land, all bets are off. Traps are allowed to be placed anywhere on private property. People participating in Montana’s first wolf trapping season that begins Dec. 15 are required to keep their traps at least 150 feet back from roads and trails. Wolf trappers are required to use leghold traps. The mandatory certification class that all trappers wanting to participate in the new wolf season this year were required to complete included a good deal of discussion on ethical trapping. On Tuesday morning, Ramberg and his dog returned to the Florence Bridge fishing access site. He was visibly shaken as he looked around the scene. Reach reporter Perry Backus at 363-3300 or pbackus@ravallirepublic.com.